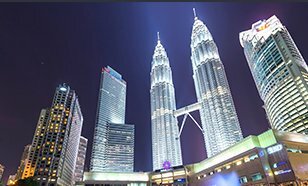 Why Book Malaysia Tours with Us? For your holiday experience in Malaysia, there cannot be any better travel partner than Tour My India who has gone international only to cater to our customer’s need to have an incredible Malaysia tour from India. We are well-acquainted with the trends and norms of Malaysia tourism industry; hence, our itineraries are manicured to offer a holistic vacation experience. This, however, doesn’t mean that we do not let you choose your adventure in Malaysia, Tour My India allows customization of packages and helps you shortlist from the hundreds of experiences that this Southeast Asian tourism destination has to offer. In case adventure is what gets you going, TMI can help you choose that unforgettable experiences like that of taking on the world’s highest via ferrata at 3,800 metres in Kinabalu or exploring the underwater universe in Sipadan Island. Since a Malaysia trip is incomplete without a gastronomic hunt, we take you to places like Jalan Alor where the clanging wok and aroma of authentic Malaysian food will make you drool. On a family vacation? We have the best tour packages that cover experiences like a visit to Malaysia’s finest theme parks in Sunway Lagoon; Genting Highlands; and to the serene Cameroon Highlands. If culture is what intrigues you, we know exactly where to take you for that heart melting experience in Malaysia ranging from George Town to Sarawak Village. Want to sight the famed Orang Utans or want to explore the ancient rainforests, our expert guides have destinations for you as well. Right from the hotel booking to transport arrangements and from appointing a guide to even handling MICE or honeymoon tours, in everything offered by us, you’d find our personal touch. With TMI, you can rest assured to have a Malaysia holiday to remember. 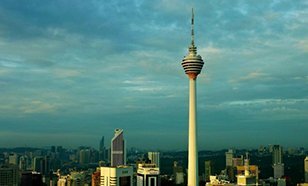 The Kuala Lumpur Tower is another landmark building of Malaysia. It is located at Bukit Nenas. This tower is even higher than the Petronas Twin towers. The architecture of the tower reflects Malaysia’s Islamic heritage consisting of Islamic tiles, Arabic scripts, Islamic floral and abstract designs which attract the visitors from all over the world. 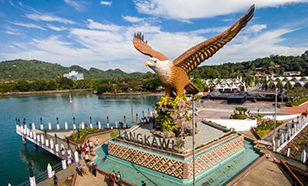 Langkawi is an archipelago made up of 99 islands, adjacent to the Thai border and surrounded by turquoise sea water, is one of the best tourist destinations in Malaysia. The UNESCO has officially declared Langkawi as one of 94 globally recognized Geoparks from 27 countries because of the island’s natural beauty, ecological harmony, geological and cultural significance. Sabah is most known for its Mount Kinabalu, one of the World Heritage Sites and declared as the 20th most prominent in the world at the height of 4,095 meters above sea level. 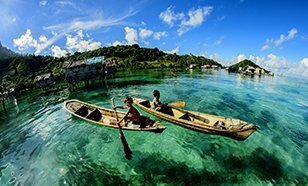 Sabah is one of the most popular tourist attractions in Malaysia, not only having the best mountains and national parks, the state is also naturally endowed with endless number of beautiful bays and beaches, a complete package for those who seeks tranquility and peace during their vacations in Malaysia. 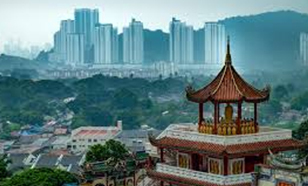 Founded in the year of 1786 by an English captain, Sir Francis Light, Penang Island was administered and remained under the British colonial rule until 1957 when Malaysia finally gained independence. Tourists from all over the globe are enticed to spend their holidays in Penang Island not only because of the historical values uphold by the state, but also because of the wide stretches of breathtaking beaches and tranquil seas of Penang Island with varieties of resorts lined up along the white sandy beaches. 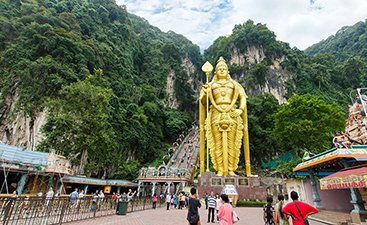 The Batu caves located in Selangor, Malaysia is a limestone hill which has a number of caves and a cave temple inside it. It is a popular Hindu shrine outside India and is dedicated to Lord Murugan. It is one of the frequently visited tourist spot in Malaysia. The temple complex mainly consists of three caves and there are a few smaller ones as well. 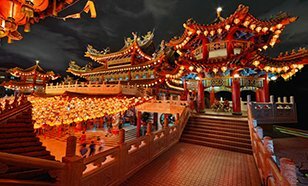 The Thean Hou Temple as the name suggests is a Chinese temple located in Kuala Lumpur, Malaysia. The temple is dedicated to goddess Tian Hou who is known as the Heavenly Mother as per the Chinese mythology. The magnificent architecture of the temple has made it a popular tourist destination in this city. 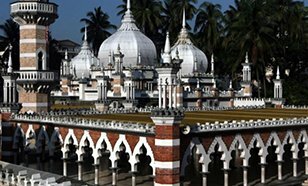 The Jamek mosque at Kuala Lumpur is situated at the place where the two rivers, Gombak and Klang meet. It is also called by a local name which is the Friday Mosque. The architectural design of the mosque is a combination of the Islamic, Moorish and Mughal work of art which mesmerizes the visitors. This place is a must visit on trip to the city to get the flavor of our ancient architectural works. 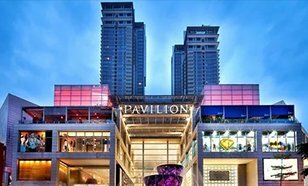 The Pavilion at Kuala Lumpur is a magnificent shopping mall which attracts a huge crowd almost all days of the week. The mall has over 550 outlets that offer various shopping materials to the customers starting from fashion to home décor items. At the entrance of the mall you will see a crystal fountain which is known as the Pavilion Crystal Fountain. The Petronas towers which are popularly known as the Petronas Twin Towers are located in Kuala Lumpur in Malaysia. These twin skyscrapers in the city are the landmark buildings which are the most attractive tourist spots of the place. They are counted among the tallest buildings in the world. The two twin towers are connected by a sky bridge. Malaysia tourism is comprised of a lot of attractions for the tourists. This vibrant place has so much to offer to you. 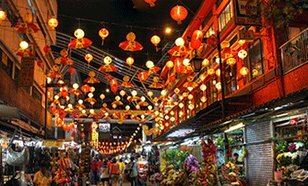 A must thing to do when you are at Kuala Lumpur is to indulge in shopping at China Town. Petaling Street is the centre area of the Chinatown of the city. It is said that the place never sleeps and is always full of visitors and buyers. It is one of the premier shopping areas in the city and has a distinct oriental atmosphere.